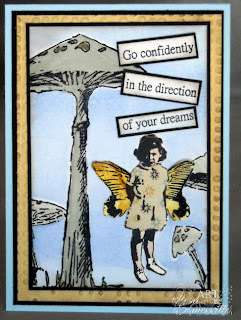 I used images and sentiments from Stampotique on my project that reflect change to go along with the Altered Alice Theme. Mushrooms (large and small) as they change in size and shape, added butterfly wings to Midge; and some paper piecing to her dress. I thought the sentiment was perfect for the challenge! The images were stamped in Black on Matte coated card stock, then masked. I added used the Spectrum Roll Technique to add color to the BG (Blue Frost), removed the masks and colored the mushrooms/grass with markers. For the Butterfly Wings, I used the Antiqued Glimmers (Wild Honey/Mustard Seed inks) technique, and Cosmo Cricket Circa 1934 paper for the Paper Piecing. Charming project, love those shrooms and the little butterfly girl! I have you on the slate to post this as a Stampotique Guest Designer on The Altered Alice this Sunday, so I may remove you from the link tool when that post goes live. Is that ok? You will be featured in the post rather than being in the linky. Thanks so much for playing along with The Altered Alice! What a wonderful card, Lisa! I love that giant mushroom, and the wings and dress on Alice. That sentiment is always perfect! Beautiful and lovely piece, Lisa! Very cute, love the colors of it and the sentiment with the changing theme. Great job and thanks for making time for the Altered Alice challenge! Love those images!!! Really cool card and beautiful colors! hi Lisa- this is really neat - LOVE the SHROOMS! :) the little girl is pretty cool too- great take on the challenge! Love the little fairy hiding under the mushrooms! Beautiful! How fun and cute! Adorable little girl in the wings, and can just taste those shrooms! Ok, you are live on The Altered Alice now! Love your post - I now have David Bowie singing "Ch-ch-ch-ch-changes" in my head and goodness knows when that will stop, LOL! Luckily I really like that song! Charming creation, the butterfly girl is so sweet and you have used one of my fave quotes. Lovely colors too, so pretty! What a pretty card! 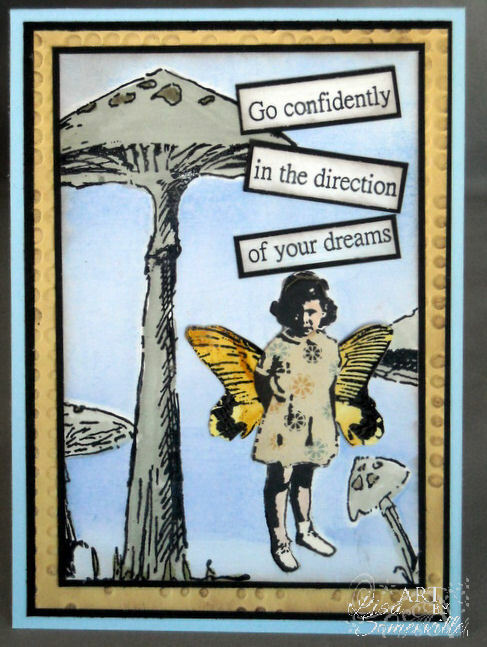 Love the alice with wings and the mushrooms! Love how you interpreted the challenge at The Altered Alice. The mushrooms work awesomely and the little butterfly girl is so sweet. Your card is really pretty. I just love the little butterfly girl with the mushrooms. Great take on the Altered Alice Challenge. Thanks for joining us.